Once again preparation is the key, but it is also vital to choose the correct type of paint to withstand the harsh Scottish weather. The type of paint used on exterior surfaces must be micro-porous and flexible. This ensures it will withstand and flex well during temperature changes. Unfortunately, in the painting trade many people corners especially on preparation and by using inferior products. In the long term this is not value for money as your paintwork will only last a fraction of the time. Therefore it is ensured that all surfaces are prepared to the highest standard when Exterior Painting. 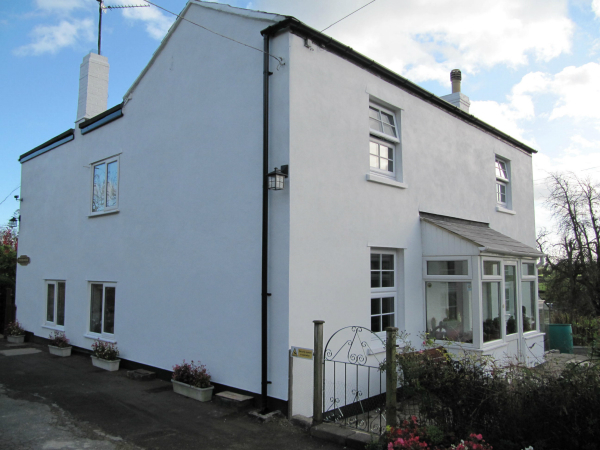 Their are many different types of Exterior Paint and sometimes choosing the correct product can often be daunting. Over the years I have always returned to one exterior masonry paint and that is Sandtex Ultra Smooth. It offers 15 year protection guaranteed when applied correctly and in the correct conditions. Sandtex has a creamy consistency which helps with application and also improves coverage per litre. It now has improved technology called Microseal which allows the paint to be breathable, water resistant and dirt resistant. This alone attracts many customers to the product and it also a great product to use for the professional and public. When applying masonry paint it is important to ensure that the surface is properly prepared. To do this make sure areas which are flaking or chalky receive one coat of exterior stabilizing solution. It is best to use the clear solution as the product is often very thin and can sometimes be difficult to apply if not done carefully, so please ensure that all areas are masked up well and dust sheets are down. Stabalzing solution is also solvent based so white spirit must be used to clean up after. Do not over apply and over seal the surface as this prevents the masonry from binding into the render. If you would like to know more information about Exterior Paint or different products like Exterior Wood Paint or Exterior Metal Paint then please feel free to browse the Decorating Tips section of my website to find many reviews and tips.